I missed my blogaversary! On January 22nd, my blog turned five. Five. How did that happen? They grow up so fast, don’t they? Every year around about this time (oh, who are we kidding? Usually on January 22…), I write a post about all the things I’ve learnt about blogging in the previous 12 months. My first two years were huge and steep learning curves, and then things tapered off a little bit – but there’s always something new to discover. This year, I’m sticking to just one thing. When I started my blog, way back in the dark ages, I didn’t really have a clear plan. I started it on a dare, because a good friend told me that I should. She knew that I wanted to write fiction and have it published. She told me that I need to get online and make a home for myself. So I did, because she’s a very forceful kind of friend who always has my best interests at heart. As the years went by, my home changed – I redecorated a couple of times, I changed my visiting hours (going from daily posts to less frequent as other writing work took priority), I even moved house, from the Pink Fibro to here – but my commitment to my blog and the community that has gathered around it didn’t waver. I try to share what I know. I try to share what I see. I try to share the little things that go on around me. Over the years, I’ve had many authors ask me the same question over and over: why? Why do you do it? Do I need to do it? (Yes, technically two questions, I know, but go with me on this). 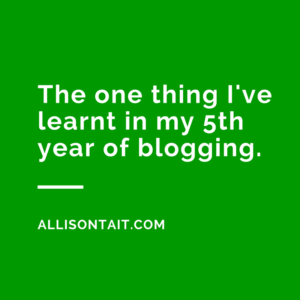 So here’s the one thing I’ve learned in my fifth year of blogging. As an author, it’s worth all the effort and the (sometimes) pain and the fitting it in and the social media whirl that surrounds it. When The Mapmaker Chronicles hit the shelves last October, and my blogging community rallied around me to cheer and share the word, I knew that all the hard work – and consistently maintaining a blog is hard work, make no mistake – was worth it. It’s worth it for the people you meet, the thoughts they share with you, the sense of community and connections you make when you venture out online. So, thank you – and here’s to another year.